Toyota's Katsuhiko Hirose displays the Mirai. He says fuel cell vehicles should cost about the same as diesel-powered vehicles. GENEVA -- Toyota may have a $57,500 price tag on its Mirai fuel cell electric vehicle when it goes on sale late this year in the U.S., but it is pressing for a much lower future price. Katsuhiko Hirose, project general manager for Toyota Motor Corp.'s fuel cell development division, said Toyota wants fuel cell vehicles to be considered in the same competitive set as gasoline- and diesel-powered vehicles. Specifically, he said, a hydrogen-powered EV should cost roughly the same as a modern diesel. "We are targeting down to the same level as a diesel with a particulate filter," Hirose said. "For this, if you price more expensive [diesel] engine and expensive after-treatment, the target cost will be similar." How soon Toyota can get there is a matter of debate within the company, he admitted. "That is a question, but once we made it for the market, huge pressure [to reduce cost] came from our chairman or president," Hirose said. "We say, 'It may take 15 years.' Their order is: 'You do it in half.' That is normal communication, then we try to extend it, and they try to shorten the target time." Hirose, who also was on the Prius engineering team, said the transition time for broad market acceptance of fuel cells probably will be similar to that for hybrids -- about 10 to 15 years. 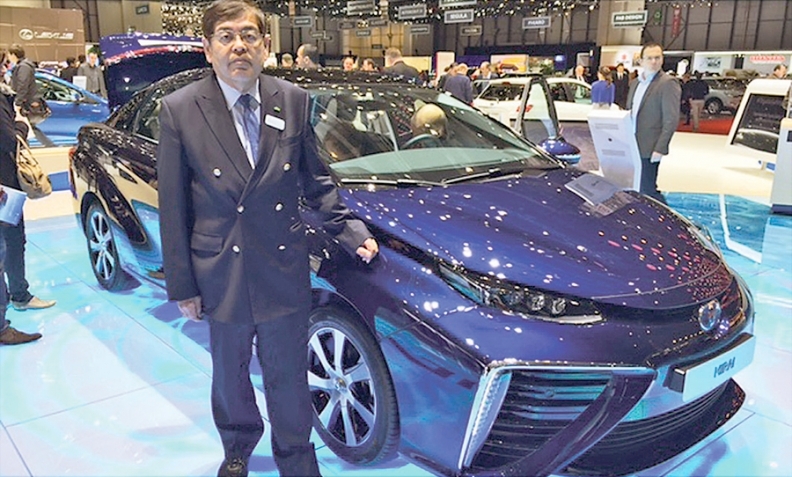 He noted that Toyota has made more than 7 million hybrids. Hirose also minimized the scant hydrogen-refueling infrastructure as an obstacle to purchase. Because fuel cell-powered EVs have a range comparable to petroleum-powered cars -- about 310 miles for the Mirai -- they don't require as many stops to refuel as battery EVs with a much lower range do to plug in, he said. That will allow customers in areas with some pumps to use the cars in typical driving patterns. Toyota is pushing into fuel cells because it sees a need for nonpetroleum power sources as the global vehicle count grows. With added sales in markets such as China and Brazil, the total number of cars in use could double within a decade, Hirose said. "How can we provide mobility with sustainability for the future?" he said. "Toyota is always thinking to make the business continue for the next centuries. To make sustainable mobility, we have to take off from fossil fuels." That means that Hirose and his team will have to move fast to meet the cost targets of Toyota leaders, he admitted: "That is the uniqueness of Toyota engineers. We are always thinking while running."